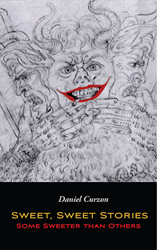 Daniel Curzon, award-winning playwright and author, raises the bar with his stunning new short story collection, "Sweet, Sweet Stories, Some Sweeter than Others." “Imagine someone reading you a bedtime story by Louisa May Alcott. Then another by Stephen King. Still another by Rush Limbaugh. What 'Sweet, Sweet Stories, Some Sweeter than Others' by Daniel Curzon won’t do is put you to sleep,” says Bud Gundy, Emmy Award-winning producer, and author of "Somewhere Over Lorain Road." Daniel Curzon, award-winning playwright and author, raises the bar with his stunning new short story collection that was written “for short story readers who like their vignettes sharp and intriguing … All these themes meld in a form of autobiography and reflection that succeeds in crafting powerful tales of angst, healing, relationships, and life’s chance interactions … Consider ‘Asylum?’ in which a woman who processes immigrants who are seeking asylum finds a way to reconsider her own role in decisions about who lives or possibly dies in the country they’re fleeing from,” notes Senior Reviewer D. Donovan at Midwest Book Review. These tales represent a lifetime of living with a super-thin skin and a lot of scar tissue from the vagaries of the world. Whether it is possessed of a “monumental originality,” as expressed by Phi Beta Kappa Reviews, the work stands as an extremely readable and unpretentious collection that explores the purpose of fiction and storytelling. Not simply a diversionary read, these compelling stories tell the truth, so people will know they are not alone in the world. About the Author: Daniel Curzon received his Ph.B. from the University of Detroit in 1960, his M.A. from Kent State University in 1961, and his Ph.D. from Wayne State University in 1969. He taught at several universities; from 1980 until retirement, he taught at City College of San Francisco. He is the author of "Something You Do in the Dark," first published by G.P. Putnam in 1971, which may be considered as the first gay protest novel. His other novels include "The Misadventures of Tim McPick," "From Violent Men," "Among the Carnivores," "The World Can Break Your Heart," "Curzon in Love," "The Bubble Reputation, "or Shakespeare Lives!," "How to Cyberbully Your Teacher," and "Halfway to the Stars: Cable Car Tales of a Grumpy Gripman." His non-fiction books include "The Big Book of In-Your-Face Gay Etiquette and Dropping Names: The Delicious Memoirs of Daniel Curzon." Curzon edited and published the early homophile magazine "Gay Literature: A New Journal" in 1975 and 1976. In the theater, he won the 1999 National New Play Contest for “Godot Arrives,” and has won many other play contests. Curzon was a semi-finalist for “The Blasphemer” in the 2016 O’Neill National Playwrights Conference. Twelve volumes of his collected plays have been published. http://www.wisehouse-publishing.com or at Amazon.com or Barnesandnoble.com.